taken by Barb Wade on May 16th. Since our post yesterday about the generosity of strangers toward a man who claimed he was down on his luck, we have come to realize that “Ian” is a prolific con-man. We have received numerous comments and emails from people all over the west coast who have had run-ins with this man — and he tells a similar sob story to everyone he meets. To quickly recap; Salem resident Chad Butler met “Ian” over the weekend. After “Ian” claimed his bike was busted up and his belongings had been stolen, Chad swung into action. He befriended “Ian” and rallied friends to raise a nice chunk of money to get him back on the road. Almost immediately after our story went up, someone notified us that they had run into this same man in 2010 and he told them a very similar story. Chad Butler on Sunday, May 27th. “I’ve seen this guy twice before also. Same story. First time I was doing a bike tour from Newport to Mendocino. He was just south of Eureka in September of 2003. Claimed his handle bar bag was stolen and was heading to SF to get his passport replaced. We ended up at the same campground that night. I saw him again on a bike coast bike tour in 2005. Same story: lost handle bar bag and needing to get to the Aussie consulate some where. I met another rider on that trip who also had the same experience. Given that we heard all these accounts in less than 24 hours, it’s pretty clear that “Ian” has likely duped dozens if not hundreds of people over the years. It’s also worth noting that, while he’s not always a model citizen, “Ian” doesn’t seem to be out to hurt or steal from anyone. He actually seems like a fairly personable guy (which is an essential trait for a con man). 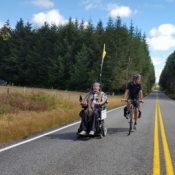 This story also doesn’t discount the admirable generosity many folks have displayed toward a stranger — and fellow rider — in need. One of the many pleasures of bike touring is all the interesting people you meet. “Ian” is certainly interesting; it’s just too bad he’s not honest. Maybe Ian should write a book about his travails and retire! I can already hear the Ira Glass intro and the reading from the excerpted book (probably written by someone about Ian, maybe one of his kids who went to Evergreen or USCB, maybe even by Ian himself) — it should be a delightful romp. In the big scheme of things, characters like these make life richer for the rest of us — too busy chasing the next buck, paying off the next bill. Ian – if you’re out there, I say go to Australia next, this story needs at least one chapter in the real Outback. Plus, please figure out a way to rebrand yourself from scam artist to folk hero. I think Jonathan’s last point(s) is the most salient here: the goodness and generosity of people and particularly our community is far and away larger than any con schemes. 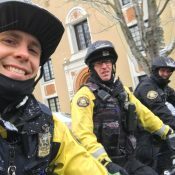 If people are interested in doing real good, there are people “down & out on their luck” out there on the streets of Portland, and ways to help them – like donating or volunteering for JOIN, Sisters of the Road, or Northwest Pilot Project – where you can be sure your generosity will go far. Just to add to the list, there is also p;ear, Yellow Brick Road street outreach, wrench raiders, Outside In, and various others that can always use a little help. 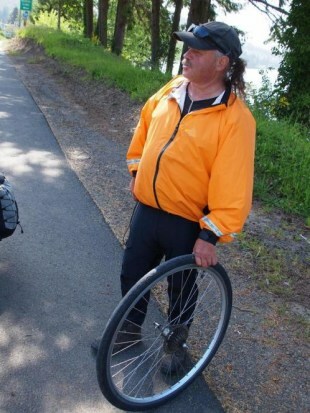 Or just really handy with the spoke wrench… to have a busted wheel at the ready at all times? Wouldn’t be at all surprised if he’s then turning around and craigslisting the goodies that shops and individuals are gifting to him. THAT would make this scam worthwhile. Ha…I met this guy in Newport a couple of years ago. I wonder if he got the local shop for anything. Yeah he got the shop a couple years ago and came in last week or so and we made him square up. Seems that Ian is a “Friend of the road”? Oh, holy crap! With this profile shot, am I seeing that he has longer hair in the back? Over ten years ago( like 1999-2000) when I lived far a away, and had more money for bike touring, I came to Cali./Or/Wa. to ride the coast often. I seem to remember this guy now around the Euerka-Ferndale area. This guy was super loud, I am talking about LOUD! This is coming from me says a lot. This is weird! I totally think it is the same man. I remember the Aussie’ accent, and his bike that was just a tad overloaded – or the bags looked very full in any case. Absolutely amazing how many people have come forward with Ian/Duncan stories. I haven’t crossed paths with him, but I’m glad for the heads-up because it seems likely that I eventually will. skimmed this article for now, but wanted to add We met him Memorial day weekend at Devils Lake, in Lincoln City two years ago. He said he was Australian and that he was sponsored and talked our ear off about gear, and mentioned having gear stolen in Portland. Another friend said he had a different accent and story. He had just come from the bar and was very much into himself. We were three gals on a Holiday weekend and mostly did our own thing at camp, luckily he found another male camper to talk bike gear with, so he left us alone. He never asked for money. I picked him up once on I-84 Thanksgiving weekend, at least ten years ago and maybe more. I had already met him drinking at the Lucky Lab prior. His rear axle was broken and he claimed he was on his way to somewhere in Canada. In the snow! He said he felt uncomfortable in my car (not surprising as I was driving over the Blue Mountains at 60mph in the snow in my old AWD Previa) and I eventually dropped him off at Farewell Bend. Good riddance for me, he stunk. Bad. I find this story fascinating for so many reason. And isn’t it strange how we seem so much more eager to help those whom we perceive to be from other countries? when was the LAST anyone saw of this guy? He almost sounds like a good guy to go drinking with. Plenty of stories! January 15, 2014 – Hells Gate State Park, Lewiston, Idaho. I recognized him from around 1995/97 from Tacoma WA. Same stories! Did I forget to mention in my previous post that Ian was/is at Hells Gate State Park in Lewiston Idaho today? He did pay for his campsite with a twenty, maybe it was the one I gave him in 1995! I recommend a new section called “Where’s Ian?” It would be interesting to track his travels. Ha! He’s still at it. I’ve seen Ian twice around Lewiston,ID. As recently as May 2014. I came across him two years prior south of Moscow, ID. Same story. Broken down and in need of help. I gave him and ride, bought some coffee, and gave him $40 when he said he needed a “little help.” I drove away thinking I may have been scammed, but could not find anything online about him. In May of this year I was riding my bike up the grade outside of Asotin, WA. Lo and behold,there sat Ian with a beer in hand. I stopped and chatted with him about where he was headed and if his bike was “broken down” again. That’s when I reminded him of our previous encounter. He wasn’t too keen on that revelation. I continued on up the road and saw him pass by me in a truck. Bike and BOB cart on a trailer. I wonder how much he actually rides the bike! Yup, what he’s doing is a victimless crime, like punching someone in the dark! Not exactly the same. The way I look at it, people are giving him money of their own will. He isn’t being violent or threatening. Fraud? Absolutely. People do say that they felt good about helping him. Perhaps what he’s really doing is selling warm & fuzzy feelings. It’s practically a public service, just like the way he has given us all something to discuss & debate! Ha! For how long do you think you could put up with his outrageous stories? Something tells me you’d be the one paying for the beers. Oh, i am quite sure i would pay for a beer. A beer is a small price to pay for stories. AS for how LONG? I would be outta there about the time my cider was done. I have the alcohol tolerance of a 4 year old. He may not be “hurting” anyone, but he is taking unreasonable advantage of people’s natural generosity. And he is committing fraud. He’s hurting the person down the road who is legitimately in need of some generosity, and who can’t get it because the person who would give it got duped by this a$$hat and assumes everybody with a story like his is just a conman. I hope people aren’t put off from helping real Australian bike tourists because of this fraud. Australian’s are generally very generous and helpful people, happy to help out a stranger in need. It’s nice to think that we’d be treated the same way when visiting other countries. Met him in Florence at Honeyman State Park. Same Australian story. My friend and I each gave him $20. Funny thing, later at Sunset Bay, met another guy from Kentucky. Gave us a similar story, but we realized he had been at Honeyman as well (camping next to “Ian”). We didn’t get duped a second time! A friend of mine and I stopped for this guy about 2 weeks ago. I felt bad for him but though he was awfully fishy. He said that he was riding from South to North…which is unusual in our area, crashed and busted his wheel and was mugged shortly before that. I think we gave him 3 bucks from my ride bag and wished him luck. Glad we didn’t give him a lift to Corvallis. Has anyone ever actually seen him riding or just broken down? He bumbed $10 from me on the Oregon Coast back in the 1990’s. I had the misfortune of witnessing his little congame at the hiker biker areas at several spots down the coast. Why bother talking with someone whose every word is extremely likely a lie or worse. It’s not worth my time and it’s not worth yours. This would stop if people would stop giving him money. Ten years on the road, and the build of an office worker. But I have to admit, it was me. I rode behind this guy for ten years and stole his wallet and passport 1000 times. I’ve run into this fellow twice while bicycle touring on the coast. The first time was about 10 years ago at Standish Hickey State Park down past Garberville. What amazed me then was how this very overweight guy with a hugely overloaded bicycle could do all the bicycling he claimed he was doing. He said he was an ex helicopter mechanic or something like that. I kind of doubted it, but he was very good at selling himself. Unfortunately, he was so loud and overbearing that he was annoying to be around. I don’t remember what name he went by then, but about 4 years years ago or so, I ran into him again at Honeyman State Park. Then he said, at least this is what I remember, that his name was “Hunter”. I recalled that wasn’t the same name he used before, and, again, he was loud, obnoxious, and annoying. But bless the people who thought he was entertaining. Yes that’s the guy. Ran into him on the Oregon Coast and Northern California in June 2008. Same sob story, someone had stolen his front handlebar bag with passport, money etc. He says he’s from Darwin and has ridden all over the world. He persuaded me to “lend” him $10 (I wasn’t expecting it back really). One thing is for certain: He is extremely loud and annoying. He will not stop bothering you at campgrounds, and repeatedly asks for food and money. Some say that this is a victimless crime. I say this is a crime of the worst sort. It is the crime of cynicism. It is stories like his that make us less likely to help the next sole who truly needs help. Remember that this rouge, could easily go sit on the corner with the rest of the day-labor or just ask for an odd job around a bike shop and support his itinerate lifestyle. He chooses to take people’s money and we are all worse for it. I think red hippie makes a good point. Once bitten twice shy. Its a bit of an anomaly of our cycling, that there is a bit of a convergence with homeless people who travel, not as a holiday or adventure, but as a need! I think though the differences quickly become obvious when out on the road. Maybe on some point this bloke is so desperate, that he needs to lie to keep going. Maybe he deserves our pity. I’d hate to think that to survive my life had become a long series of cons. It’s a bit sad. But even sadder if that once lied to, a good person never trusts again. Then the crime is carried forward forever. Don’t let one bad apple spoil the whole bunch, there are many more good people in this world. Good point redhippie. Besides the fact that he’s defrauding people, he makes it that much less likely that one of the rest of us would get help, should we find ourselves in an unfortunate situation on the road. I know it’s a little late but “Ian” passed through Pendleton yesterday. He may be on his way to Milton-Freewater / Walla Walla or LaGrande. Any guess how old this guy is? I think he maybe a relative of mine that I haven’t seen in over 15 years. The stories sound all too familiar, as he conned us too, but it’s been a long time since we’ve seen him so it’s hard to confirm from the pictures. He would be in his late 30’s early 40’s by now. We met him “broken axle for his BOB trailer” 30 mi. outside of Portland. Didn’t offer him anything besides water and a chance to call a shop. Oops meant to say that was August 11, 2012. I read about him in Adventure Cycling and was like — that guy sounded familiar! Talked to him at the intersection of US 26 and Oregon 47 on Saturday, August 11 as we were heading from Portland to Cannon Beach. Said he’d been clipped by a truck and broke part of his Bob trailer and that his passport and money had been stolen in Portland. 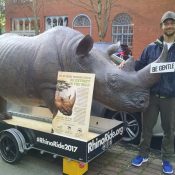 Ian sighted this week in Florence, OR. That is one interesting rig crazyguyonabike is riding. Way more interesting than “Ian’s” jalopy. Wow. He’s BAAACK….. I saw Ian today in Arlington OR, by the public restrooms at the city park just off the freeway. He was pushing an overloaded bike / trailer combo. He was wearing the same orange jacket as in the top photo on this page. He tried to start a conversation with me by asking the time. I replied “Sorry Ian, I don’t have any idea what time it is.” He left the area immediately afterwards. I think he got the idea I knew who he was. As I drove out of Arlington he was sitting by the yellow caboose with his bike and trailer. I was hoping to get a picture but at that point I couldn’t stop to take one. I have cycled Seattle to San Francisco 6 times,1998 to 2008, and have talked to ian 4 times with a different story each time, last trip he said he just spent 3 years in india.my comment was,, didn’t i see you last year at Humbug mt. He kept right on going.and we all laughed. I think he lives in Willits calif.
Ian was in Waldport Or yesterday. He stopped by the Green Bile Co-op. Having encountered him before, I did not accommodate him. He was able, however, to sponge a free cup of coffee from the adjacent Espresso shop. He spent 3 hours sitting at the outdoor table. Thanks Rick, always fun to know he’s still at it. Did you happen to actually see him RIDING the bicycle. Just curious. May this thread continue forever with colorful updates. Or, someone should tip Ian off to the fact that he’s famous – and show him this discussion on their laptop or smartphone. Ive known Ian for the last couple of years. He stops into my shop every three or four months. Funny thing is.. he never asks for anything other than some lube or a tool for a quick fix. I do realize he’s a bike bum, but he’s also one hell of a guy to drink a couple beers with! Keep on keepin on Ian!! Anyone seen Ian this summer? Well I came across Ian two times in the last 10 yrs once on the coast and once coming out of halfway going to baker both times diff story.and he didn’t remember me. And the con was still there after I told him I meet him before.nothing out of me. But I’d be even more interested in the logistics of his book tour. The whole thing could loop back on itself. Conman-becomes-celebrity-cons-everyone-to-paint-his-fence/give-him-a-ride/sell-his-book. 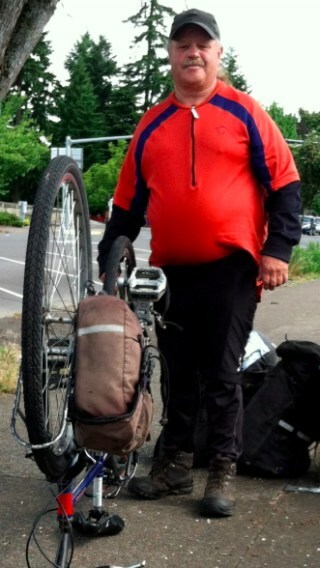 Ian is on the road, pushing his bike through Lewiston, ID. I stopped and mentioned to him that he has quite a following on the Internet. He didn’t seem too concerned. I asked him where he was from and how long he had been riding the bike. He said “Alice, Australia” and “twenty-five years.” He said there was no better place to be than on a bike headed somewhere. He mentioned that he has worked all across the country. He was headed to Joseph, OR and then on to Baker City. He didn’t ask me for anything, but looked down at his rear tire and gave the bike a push to show me he was low on air. I don’t know if he was using that to get sympathy or a ride somewhere. The last I saw him he was pushing his bike to Clarkston, WA. Just gave “Ian” a ride last Sunday, 7/19/2015, from Lakeside MT to Missoula MT. All the stories I read above sound so similar to my experience. His wheel was really broken and he said he had been robbed in Browning MT. He did not strike me as very personable at all. Initially, I felt sorry for him but quickly grew suspicious. He told me he had ridden from NJ to this point. Hearing this I immediately wondered how he still retained his bulbous beer gut. I gave him a ride to the local bike shop in Missoula. He said he would not receive a wire of money until Tuesday and only had $.13 left. I had grown suspicious of him and suspected any further generosity would just leave him wanting more. So I said you are welcome for the ride, this is a good spot for us to part ways. I told my wife the story and she found this post. Nice pictures, he looks about the same. I wonder what ‘Ian’ thinks about when he’s falling asleep at night? (a) that was an excellent day! Got two rides and ‘made’ $25! (b) what story am I going to invent tomorrow to con people into giving me rides and money? (c) Maybe I should get a patch kit and some rudimentary tools so I can actually fix my bike? Come to think of it, there was a bicyclist heading west on I-84 this morning just past Viento. I saw two tourers battling the westerlies together as well, but this one fellow kind of struck me as familiar; maybe this is why. Didn’t get a clear look though, as it was enough to keep the car steady in the headwinds. Will be interested to hear if any Portland area sightings this week. Okay, we just met this guy in Ashland, OR a few days ago! We live near the bike trail and so invited him in for a burrito. Then we put him up at a nearby campground (paid for it and 5.00 for laundry money) His story was so odd, it made me wonder. Why did he chose to bike across the US in the dead of Winter? Was he really from a family of miners? Does he really work for Quantas Airlines? The things I DID believe (that he was robbed in Eugene, that his friends were driving him to SF to get a new passport) apparently aren’t true. Not sure what to believe at this point! I too fell for this man’s story of woe. 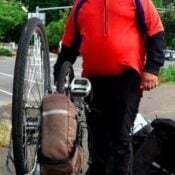 He arrived in Waldport about a year ago stating he stopped to use a restroom at a park on Hwy 18, and when he came out, his saddle bag with $ and camera etc had been stolen. He came into the bar, and when everyone heard his story, he got free beers, free dinner and $. I gave him $100. to tide him over until his “friends” from California could wire him some money. What a little rascal……Can’t say I am bitter about the experience, but I will be waiting for him to do a return trip to the coast!!!! !